If you follow me on social media then you'll know that I've been sharing recipes inspired by the themes of the latest series of Great British Bake Off each week. I'm really enjoying the series and today's recipe ties in with last night's theme of "Spice Week" and also pays homage to the humble pear, which Noel talked about the previous week as being an under-rated fruit! This comforting crumble may not be much to look at but is the perfect warming dessert as the temperatures drop (of course, the return of "GBBO" also means that autumn is inevitably upon us!). It pairs pears and ginger, already a match made in heaven, with an indulgent chocolatey topping which takes the classic combination to the next level. I think that Paul and Prue would approve! 1) Place the pears, cinnamon stick and grated ginger in a medium-large saucepan and just cover with water. Bring to the boil on the hob and then simmer until the pears are softened (approx 15 minutes). The time taken will vary depending on the ripeness of the pears. Remove from the heat and stir in the maple syrup. Set aside. 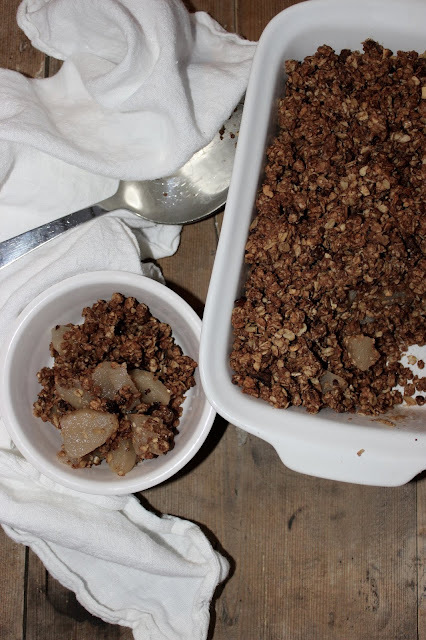 2) Meanwhile, make the crumble topping. Place the oats and cashews in a food processor and whizz briefly to break up (you still want the mixture to have some texture to it, it shouldn't resemble breadcrumbs). Place in a mixing bowl and stir in the cacao powder, cacao nibs and sea salt. 3) In a smaller bowl, whisk together the cashew butter, coconut oil and vanilla. Add the nut butter mixture to the dry ingredients and stir to throughly combine. 4) Preheat the oven to 180 degrees C.
5) Place the pears into an ovenproof dish in an even layer and top with the crumble. Bake for 15-20 minutes.